Home Smartphones [PROMO ALERT] Buy an Acer Liquid Z520 and get 3 Amazing freebies! 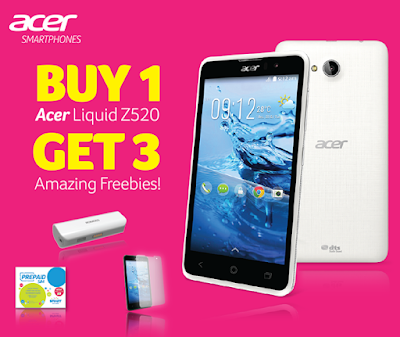 [PROMO ALERT] Buy an Acer Liquid Z520 and get 3 Amazing freebies! Acer Philippines recently announced a promo where you can buy an Acer Liquid Z520 and get 3 amazing freebies! You get a FREE Powerbank, Screen Protector and Smart Data SIM! This Acer Liquid Z520 is available for Php4,990 and promo runs until August 30 only. Don't miss out!